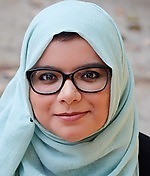 Info Aisha is a professional advocate for immigrant rights at the state Capitol, working with legislators on both sides of the aisle to push for civil rights for immigrants and people of color. As policy director for a nonprofit legal and advocacy center, Aisha monitors local, state, and federal policies that affect immigrants and works to fight for their rights. Aisha moved to Gwinnett County at the age of 6 from south Florida. Since then she has lived in the Collin Hills area, Suwanee and now Duluth. Aisha is the middle of five children and has always been surrounded by a large extended family. Growing up in Georgia, Aisha took advantage of every opportunity given to her. She graduated with honors from North Gwinnett High School and earned the HOPE Scholarship to attend the University of Georgia where she earned her Bachelors of Arts in Journalism in 2013, and a Masters of Public Administration & Policy in 2016. In college, Aisha took a special interest in working with students with disabilities and worked at the University’s Disability Resource Center. After her undergraduate career, she continued her passion for individuals with disabilities working at Gwinnett Technical College in the Disability Services department. Shortly thereafter, she joined her graduate program to study Public Administration & Policy to learn more about how to make an impact in government. While in graduate school Aisha founded an organization to increase voter turnout in the American Muslim community. In 2016 she and her team helped to increase voter turnout across Georgia in a community that has historically rarely participated in the electoral process. Aisha is actively involved in her community. She was a co-organizer of Atlanta March for Social Justice & Women (January 2017), which saw an estimated 60,000 people peacefully march in downtown Atlanta. She also earned a scholarship to participate in the National Labor Leadership Initiative, Southern Program. Aisha has participated in the Gwinnett Citizens Academy (Fall 2016 Cohort) and served on the Advisory Committee for the Downtown Suwanee Redevelopment Commission (2014-2015).